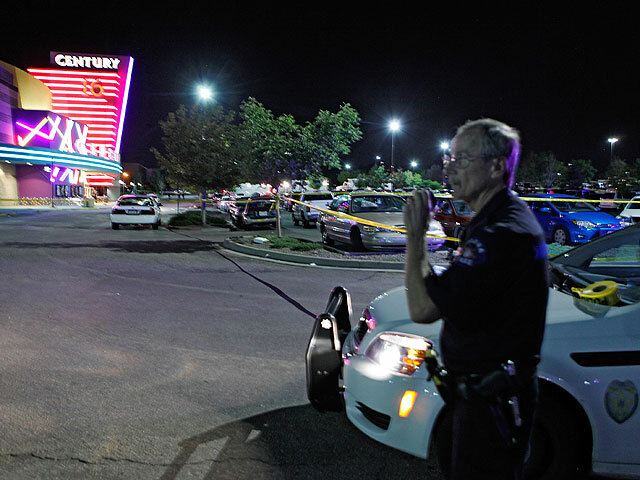 Questions remain over mass shooting at Batman screening in Colo.
(CBS/AP) AURORA, Colo. - A gunman clad in body armor and wearing a gas mask opened fire on moviegoers at a midnight showing of the latest Batman movie Friday, killing 12 and injuring dozens more in one of the deadliest mass shootings in recent U.S. history. The violent and chaotic scene erupted at about 12:30 a.m. local time as the suspected gunman, identified as 24-year-old James Holmes, stood at the front of one of the Century 16 theaters at the Aurora Mall where "The Dark Knight Rises" was playing. Witnesses reported that the gunman entered the theater through an emergency exit door and authorities said he threw two gas canisters before opening fire. "Then it was a blur," Spenser Sherman told "CBS This Morning" said. "Then I heard a couple gunshots." "I thought it was part of the movie, like a fun little prank - that it would be over in a few seconds. It obviously wasn't." She said she only saw a silhouette of the suspect, and that the gunman said nothing. "Everybody had dropped to the floor after the first couple gunshots, and then he fired some more. And then after that, there was a pause in the gunshots. Some people say he was reloading, I don't know. But at that point, my boyfriend was like 'This is the time, we need to go, we need to get out of the theater right now.' So we ran." Aurora Police chief Dan Oates had earlier said a total of 71 people were shot, including the dead. Of the 59 people wounded, some were critically injured, though Oates couldn't give an exact figure. Jennifer Seeger told CBS station KCNC the suspect first fired up towards the ceiling, as if to scare people, and then started spraying the audience. He pointed the gun directly at her; she ducked. "He had a gas mask on so I couldn't see his face," she said. "All I smelled was gunpowder in the air, and gas was getting to me." The suspect marched up the aisle in the stadium-style theater, picking off those who tried to flee, witnesses said. Authorities said he hit 71 people. One of them was struck in an adjacent theater by gunfire that went through the wall. "He would reload and shoot and anyone who would try to leave would just get killed," said Seeger, adding that bullet casings landed on her head and burned her forehead. Within minutes, frantic 911 calls brought some 200 police officers, ambulances and emergency crews to the theater. Holmes was captured in the parking lot. Police said they later found that his nearby apartment was booby-trapped. Authorities gave no motive for the attack. The FBI said there was no indication of ties to any terrorist groups. Holmes wore body armor, used an assault rifle, a shotgun and a Glock handgun, Oates said. He said investigators are confident the gunman acted alone. A second Glock handgun was found in Holmes' car. All the guns were purchased legally between May 22 and July 6 at three Colorado stores, CBS News correspondent Bob Orr reports. FBI agents and police also discovered Holmes' apartment was booby trapped. Authorities evacuated five buildings as they determined how to disarm flammable and explosive material. "It's something I've never seen before," Oates said. CBS News has learned that some loud music blaring from Holmes' apartment around the time of the attack allegedly was designed to draw a noise complaint from a neighbor, thus luring police into his residence, sparking a firebomb and diverting resources from the movie theater. A federal law enforcement official said the suspect bought a ticket and went into the theater as part of the crowd. He is believed to have propped open an exit door as the movie was playing, put on protective ballistic gear and opened fire. The official spoke on the condition of anonymity to discuss the ongoing investigation. After initially cooperating with police, Holmes has since gone quiet, leaving authorities still searching for a possible motive, Orr reports. Police confirmed that he had dyed his hair red, CBS News senior correspondent John Miller reports. New York City Police Commissioner Raymond Kelly said Holmes told authorities he was "the Joker," a reference to one of Batman's arch-enemies. Kelly didn't reveal the source of his information, but he is reportedly close to Aurora Police Chief Dan Oates, who is an NYPD veteran. Federal law enforcement officials said there is no indication it is terrorism-related. Authorities started to remove the bodies from the theater on Friday afternoon. Officials wheeled a black bag on a stretcher out of the front entrance, placing it in the back of a minivan. Ten people died in the theater, while two others died from their injuries later. Aurora police say victims are still being identified and not all the families have been notified. Jessica Ghawi, a sports blogger also known as Jessica Redfield, is among the dead, her brother confirmed. Jordan Ghawi told The Associated Press his sister's death comes as a "complete and utter shock." Ghawi recently wrote of leaving a Toronto mall moments before a June 2 shooting that left one dead and seven injured. Jordan Ghawi said on his website that a man who was with his sister at the theater described the chaos, saying he and Jessica Ghawi dropped to take cover when the gunman first started shooting. Jessica Ghawi was shot in the leg, her brother wrote, describing details relayed to him by a man identified on the blog only as a mutual friend named Brent. Jessica Ghawi began screaming when she was shot, and the man with her tried to calm her and stop the bleeding, according to Jordan Ghawi. The man was then shot, but he continued attending to Jessica Ghawi's wound before he realized she had stopped screaming, Jordan Ghawi stated. The man said Jessica Ghawi had been shot in the head. Some of the injured were children, with the youngest a 3-month-old baby who has been released from treatment. Victims were being treated for chemical exposure apparently related to canisters thrown by the gunman. The Pentagon said three military members - one sailor and two airmen - were wounded in the incident. Another sailor remained unaccounted for. Aurora is home to a large Defense Department satellite intelligence operation at Buckley Air Force Base. The nature of the attack suggests it was well planned. The suspect's vehicle was parked at the rear of the complex, near the emergency exit where he was reported to have entered from. On Friday morning, police escorted Holmes' father, a manager of a software company, from their home while his mother, a nurse, stayed inside, receiving visitors who came to offer support. Holmes also has a younger sister. "As you can understand, the Holmes family is very upset about all of this," Lt. Andra Brown, the San Diego police spokeswoman, told reporters in the driveway of the family home. "It's a tragic event and it's taken everyone by surprise. They are definitely trying to work through this." Police released a statement from his family that said: "Our hearts go out to those who were involved in this tragedy and to the families and friends of those involved." There have been no indications so far that Holmes had any run-ins with the law before Friday. Tom Mai, a retired electrical engineer, said Holmes was a "shy guy" who came from a "very, very nice family." Holmes graduated from University of California, Riverside, in the spring of 2010 a bachelor's degree in neuroscience, a school spokesman said. Mai said the mother told him Holmes couldn't find a job after earning a master's degree and returned to school. In 2011, he enrolled in the Ph.D. neuroscience program at the University of Colorado-Denver but was in the process of withdrawing, a university spokeswoman said. Holmes lived in an apartment in Aurora, and FBI agents and police who went there discovered it was booby-trapped when they used a camera at the end of a 12-foot pole to look inside. It was the worst mass shooting in the U.S. since the Nov. 5, 2009 attack at Fort Hood, Texas, when an Army psychiatrist killed 13 soldiers and civilians and more than two dozen others wounded. In Colorado, it was the worst since the Columbine High School massacre on April 20, 1999. Students Eric Harris, 18, and Dylan Klebold, 17, opened fire at the school in the Denver suburb of Littleton, about 15 miles west of Aurora, killing 12 classmates and a teacher and wounding 26 others before killing themselves in the school's library. The shooting occurred in Theater 9, which has a capacity of around 300 people, according to KCNC. Corbin Dates told CBS News correspondent Barry Petersen he saw a man take a phone call by the emergency exit and possibly try to signal or look for somebody during the movie's opening credits. After the movie started, the emergency exit door swung open. "Somebody walks in dressed all in black, helmet, gas mask, black outfit, you cannot see anything but the person's eyes," said Dates, "and there was a gas can that was thrown into the audience behind me. It went off. I thought it was a stunt of the movie, so I didn't think anything serious of it once it went off." When gunshots went off, Dates and his friend dropped to the floor and started to crawl through the theater, he said. "I felt the caps from the bullets burn my leg," Dates said. William Kent, who was in an adjacent theater, said bullets came through the wall but with the action on screen, people didn't realize what was happening. "And they started the fire alarm or the emergency alarm, said that there had been something that happened in the building and evacuated everybody. There was a huge commotion to get out of the theater. When I exited, there were police officers with assault rifles running in," Kent told CBS News. Benjamin Fernandez, who was also in an adjacent theater, said he saw a young girl, around 12 or 13 years old, lying on the concrete when he exited the building. "From what I saw, she had two bullet wounds in her leg and just blood all over her stomach. Her friends were all just yelling, crying. ... We were just all pretty much in shock," he said on "CBS This Morning." President Barack Obama addressed the shooting from Fort Myers, Florida, calling for a moment of silence. "There are going to be other days for politics," Mr. Obama said. "This, I think, is a day for prayer and reflection." The president thanked the gathered crowd and told them he was grateful for their support. "I was looking forward to having a fun conversation with you about some really important matters we face as a country ... the differences between myself and my opponent in this election," he said. "But this morning we woke up to news of a tragedy that reminds us of all the ways we are united as one American family." Mr. Obama also ordered to fly at half-staff or half-mast at the White House, all public buildings, military posts, naval stations, naval vessels, and U.S. facilities abroad until July 25. Republican presidential candidate Mitt Romney also planned to address the shooting. In a statement, he said that he and his wife, Ann, were "deeply saddened by the news of the senseless violence" that led to the loss of life and injuries. He said they were praying for the families and loved ones of the victims "during this time of deep shock and immense grief. We expect that the person responsible for this terrible crime will be quickly brought to justice." "The Dark Knight Rises" opened across the world Friday, but the shooting prompted officials to cancel the Paris premiere, with workers pulling down the red carpet display at a theater on the famed Champs-Elysees Avenue. Two police officers were stationed outside the AMC theater in New York's Times Square. Warner Bros., which produced "The Dark Knight Rises" said the company was "deeply saddened to learn about this shocking incident. We extend our sincere sympathies to the families and loved ones of the victims at this tragic time." A spokesperson for Cinemark Holdings, Inc., the owners of Cinemark 10-Aurora, told CBS News: "We are deeply saddened by this tragic incident. Our thoughts and prayers are with the victims, their families and loved ones, our employees, and the Aurora community. We are grateful for the quick and professional reaction of all local law enforcement and emergency responders. We are working closely with the Aurora police department and local law enforcement."